This Firmdale townhouse hotel to the north of Soho is well known for its individually designed rooms, buzzing bar and private screening room. The 52 rooms and suites include an open plan penthouse with views of London's rooftops and the BT Tower. 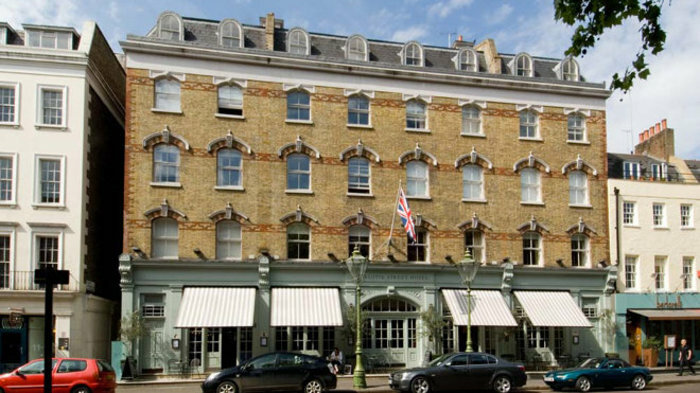 Stylish Firmdale group hotel north of Soho. In the heart of London's media district just north of Soho and a minute's walk from leafy Soho Square, this lovely townhouse hotel is the epitome of metropolitan sophistication. Owned by Firmdale Hotels, the group's designer Kit Kemp has used a 'Bloomsbury Group' theme throughout the hotel which features original art from the period while Bloomsbury artists Duncan Grant and Vanessa Bell are the inspiration behind the drawing rooms. A stunning Alexander Hollweg mural reflecting scenes of 'contemporary London life' forms the backdrop to the modern European cuisine in Oscar's restaurant. The hotel also has its own 67-seat cinema showing an eclectic mix of classic films on Sunday nights where drinks are served whilst you watch the film. Tea can be taken in Oscar Bar and Restaurant or the Drawing Room. Afternoon tea is served all day long at the Charlotte Street Hotel and can be taken in Oscar Bar and Restaurant or the Drawing Room with its log burning fire and original art by Bloomsbury artists Vanessa Bell, Duncan Grant and Roger Fry. Served in pretty tea pots, Earl Grey, jasmine and chamomile teas are accompanied by a selection of traditional cakes, fruit and plain scones, and sandwiches. Add some sparkle with a glass of Pommery, or opt for the Bloomsbury Tea and you get a chocolate eclair, lemon and vanilla Charlotte, strawberry tart, and coconut cake. These are supplemented by smoked salmon roulade, cucumber, basil and creamed cheese, and roast beef, horseradish and watercress sandwiches, and asparagus and Stilton quiche. A stylish and glamorous place to have Afternoon Tea. A bold, bright bistro where modern British classics are served. Small but fully equipped gym and treatments in your room. The Charlotte Street Hotel has a small but fully equipped gym on the lower ground floor with various cardio-vascular machines, free weights and exercise mats. The hotel also offers a full range of body and beauty treatments which guests can enjoy in the comfort of their own room. All Firmdale Hotels offer this service through their partnership with Temple Spa who provide a unisex range of luxury products and treatments created to combat the stresses and strains of everyday life. They offer everything from an express breakfast facial to a relaxing 90 minute aromatherapy massage, guaranteed to leave you relaxed, calmer and totally chilled out. Private 75-seat cinema open to hotel guests and members of the public. Not all London hotels can say they have their own cinema. Nor one where Stephen Fry, Alan Yentob and Simon Pegg turn up to see Terry Gilliam's soon-to-be-released film. Seating 75 people, the Charlotte Street Hotel's state-of-the-art screening room is a private mini cinema, available for guests and private hire which also serves as the venue for the Sunday cinema club. A 'club' in name only, hotel guests and members of the public can dine in Oscar, the hotel's restaurant and bar, and then see the film of the week which varies from a classic to the latest releases. Situated on the lower ground floor adjacent to the hotel's two private event rooms, the cinema has plush leather seats, great picture and sound quality, and you can order drinks at the bar to be brought over to you while you watch the film. Screening rooms are a feature of three of the Firmdale group's London hotels - Soho Hotel, Covent Garden Hotel and Charlotte Street Hotel - as well as their Crosby Street Hotel in New York. From cheap budget accommodation to luxury 5 star suites see our discounts for hotels, including Hilton London Olympia Hotel from 72% off.